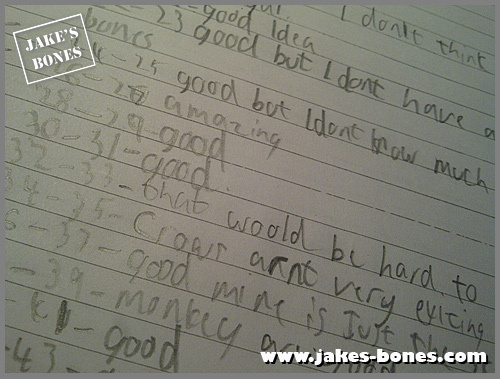 You are here: Jake's Bones > A quick SNEAK PEEK at my book so far ! One of the most exciting things when I was in London was visiting Octopus Publishing (where TickTock are based) to talk with my editor Jo about my book. Mum, dad, me and my two young brothers got the tube then walked to Shaftesbury Avenue where there is a massive office block where Octopus Publishing are based. The views from their offices were amazing, and you could see the London Eye, St Pauls, the Shard and another big building nicknamed 'the cheesegrater'. We were in a big boardroom and Jo had arranged drinks and snacks for us all. Sam and Harry played nicely with their toys (and my baby brother Harry did a big noisy poo, which is probably the first time that had happened in a meeting there) and Jo showed me spreads of the whole book, and some new completed pages and I'm allowed to show some of them here now ! What I can tell you is that the book is looking really amazing. It is now ten months since Octopus first got in touch to ask if I would be interested in writing a book and eight months since we had our first meeting. 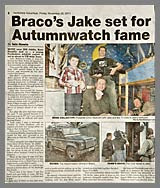 In that time, Ticktock have designed a plan for the book, increased the pages from 48 to 64, asked a cartoonist to draw a cartoon version of me, selected my blog posts, designed and redesigned pages, and asked Dad to take more photographs. 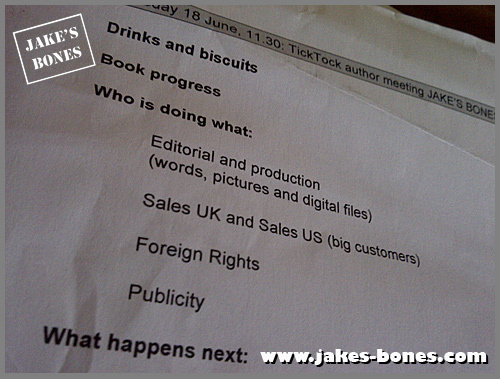 About a month ago, you could see from the plans that the book is really starting to come together. Every time new pages are designed, I blu-tak them on the wall above my desk, and I'm starting to run out of space. 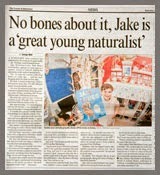 What I can tell you is this is going to be the most amazing children's book about bones I have ever seen ! 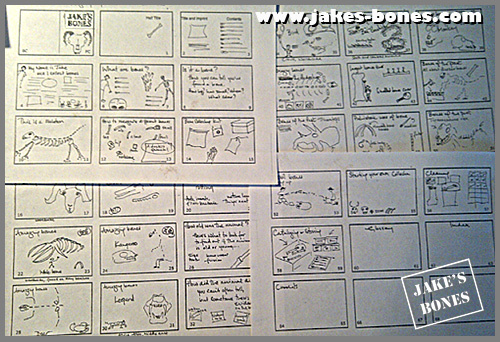 So this post is all about how the book has developed from the very first sketches to the (almost) finished pages. There still about another eight months to go before the book is launched ! (It's going to be the start of March 2014). That's because every page and every fact has be checked and double-checked, then the book had to be finally sent to the printers and shipped back. But it is very close to being finished, and tonight I even wrote my dedication (a bit of a thank you to people) for the start of the book. It's even started being listed on some booksellers websites. This is it on Munro Books in Canada, Follet Early Learning in the USA and on Amazon.com (thanks to Jana Miller for spotting that, it's not on the co.uk one though). 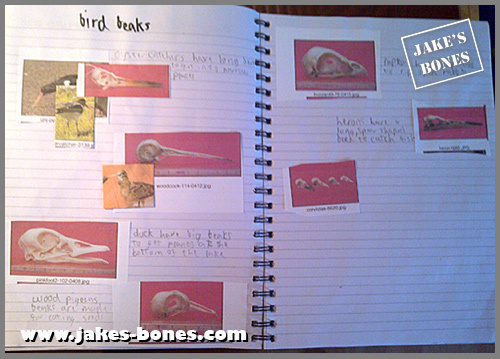 There were other ideas I sketched out too, which I hadn't written blog posts for yet, like "the seven golden rules of bone collecting" and "what to take when you go bone collecting" (that page is below). Jo had sketched out her ideas as well, and hers looked a lot more professional. This was from October 2012. Each rectangle is what the book would look like open at each page. These were where I wrote out what I thought of her page plan. I had forgotten I had written this until I found it in an old notebook ! Then the page plan was redesigned again to join Jo's ideas and my ideas together, then work begins on each double-page spread. Designing is very complicated. It begins with my blog posts. Jo then works on the text, and chooses which pictures go with what page. Most of them dad has taken (like my articulated fox Vulpy below), but some are from photo libraries (like the human skeleton below). Jo then sends her ideas to me, and I make changes or say fine. 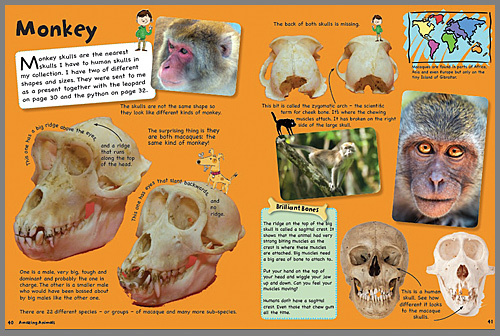 Then it goes to the designer, then back to me, then to Paolo from the Horniman museum (who is the book's consultant and expert fact checker) and then to the publisher for approval. It's just like writing a blog post, except a zillion times more complicated. So here's a TINY sneak peak of the book so far, but lots of little changes are happening on the pages even as you read this ! 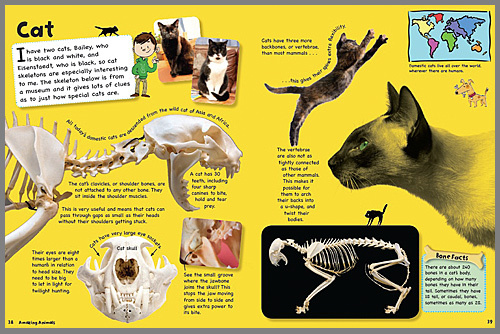 My cats even get to appear in the book ! 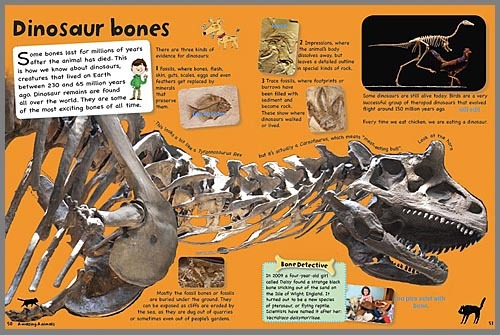 What I'm really, really excited about is that when I was learning about bones there were no good introductory books for my age group (or even for non-scientists) and it took me a long time to learn. 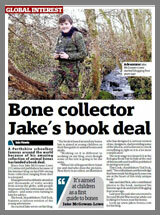 I think that brilliant that I have the chance to explain what I have learned to other young bone collectors. I'm am so incredibly proud of it so far. But what do you think ? I think it looks AMAZING and I can't wait to buy it! 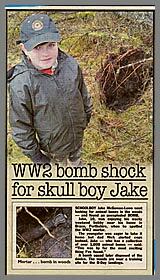 Very well done Jake! It's looking great, Jake. I'll be buying copies for myself and for my grandnieces/nephews. I think it looks amazing! Well done you! Can't wait to see it published! This is such exciting news! 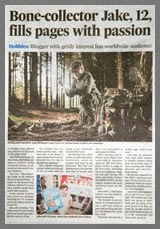 It's great to read how involved you've been with the editorial process too - it's a fantastic experience. We will eagerly look out for the book! I'll definitely be buying a copy too! OK I know what I'm gonna spend next years Christmas money on! 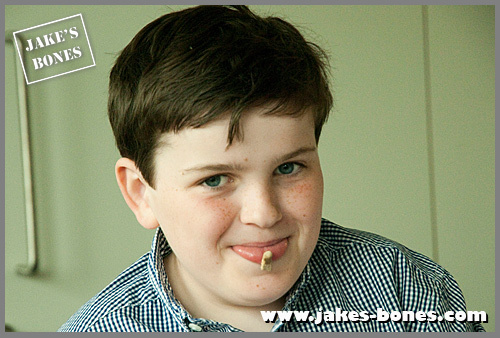 Oops its jack here for some reason that posted from my mum's profile. I LOVE IT! I can't wait to get my hands on it! The pages look easy to read and to understand... it hard to find books that tell you things and to understand them. 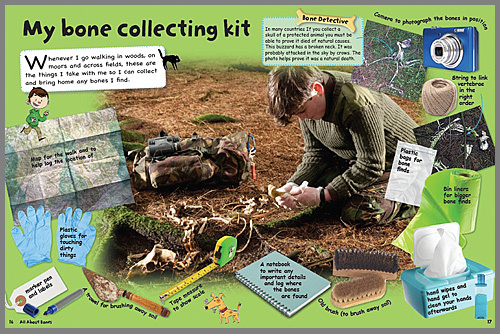 The bit on what to take with you when bone hunting is a really good idea and will definitely inspire others to give it a go! Ha ! Sometimes I do that too ! Thanks ! 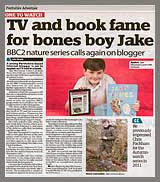 I couldn't find a good bone book aimed at young children when I was starting, it's brilliant to be writing one. Thanks ! That was one of my chapter ideas from the first meeting I had with my editor. This looks like an amazing book, and just the type young people would want to look at and read! Good for you! Thanks ! It's almost finished, I was writing one of the last bits last night. This looks so cool... I'll definitely be buying a copy myself. Looks like an interesting book for kids and adults. 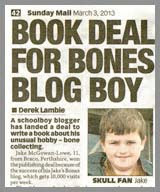 I wish I had a child in my life who loves to collect bones as much as I do. I can't wait to see it in bookstores. I hope it comes to the US! It's definitely be in the US, it's on Amazon.com already. Your book is definitely listed on Amazon UK too because I was able to add it to my wish list. Good luck with the final editing and bits and pieces. It's a lot of work creating a book. However I think it's going to sell really well, I just have a hunch. PS I'm about to write a blog post about bones and that's how I found your blog. You have better information here than on the Alaskan Govt website about cleaning and preparing bones. Thanks ! It looks like it was added to Amazon Uk after I wrote the post. I think that's the US cover you can see on the UK site though, but I'm not sure. The book is lookin' great! Will definitely not miss the chance of getting it! 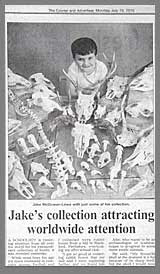 Hi Jake, My name is Ashlee, I'm 19 from Australia and have recently fallen in love with bone collecting. I have a fascination, utter respect and love for animals, bones and the dead. Alot of people think I'm rather odd for this, but seeing an 11 year old boy doing the same thing, and reaching new limits, is overwhelming and inspiring. Keep up the great work Jake, your work has inspired me to reach new heights, I will purchase a copy of your book, and hopefully one day in the future, we could go collecting in the outback, Australian mammals and animals are truly beautiful. I already have a nice collection of skulls and birds I would love to share, I plan to make jewlery and art out of certain pieces. Keep me posted buddy! 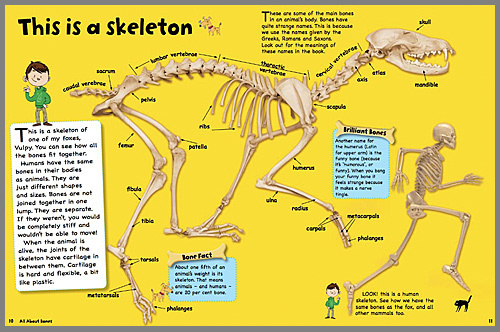 Its so important to educate children on animals, we need them around forever.